Discover the latest in luxury shower trends, and start modernizing your home with Cossentino & Sons! Innovation in technology has allowed homeowners to improve their experience in the kitchen, but today’s architects are planning homes for full-technology integration. From voice-automated garage doors to smart HVAC systems, the technological world is rapidly evolving, and homeowners are taking advantage of the developments. Discover the latest in luxury shower trends, and start modernizing your home with Cossentino & Sons! Steam rooms and saunas are the ultimate luxurious experience, and now you can enjoy the comfort of a steam room at your own home. 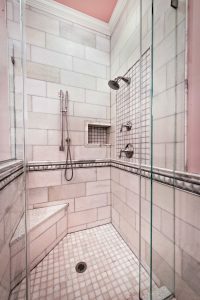 An expert contracting team can help you with the new design, or convert your walk-in shower to a steam shower. Specialized equipment keeps water vapor inside, and advanced technology prevents condensed steam from dripping down while you enjoy a steam. Consider incorporating a bench seat and dual shower heads for complete relaxation. Doors and steps limit the space in the master bath and can make bathing difficult for homeowners with mobility issues. A wet room creates an open-plan design, allowing for homeowners to relax and move freely throughout the space. There are no doors to open, no curbs to step over, and no obstacles between you and your shower. Talk to your contractor about adding heating floors to improve your bathing experience further. Forget the standard shower head; homeowners are now opting for the vertical spa. These luxurious showers are equipped with body jets, a handheld showerhead, and a soothing rainfall showerhead. The vertical spa doesn’t just provide a thorough clean, but it’s been proven to ease muscle tension and relax your entire body. This shower is perfect for active homeowners who enjoy cycling in the morning or swimming in the afternoon. The installation process requires the expertise of an experienced contractor, so ensure that you work with a company you can trust! Start Planning Your Luxury Shower Upgrade Today! This entry was posted on Saturday, June 16th, 2018	at 12:50 pm	and is filed under Remodeling	. You can follow any responses to this entry through the RSS 2.0	feed. Both comments and pings are currently closed.